The Dermestidae is an interesting family of beetles, not only for the distinctive ‘woolly bear’ morphology of many of its larvae but for their ability to consume dry organic matter including keratin and chitin in natural history collections. Neglected collections of Victorian butterflies and moths were sometimes totally destroyed when populations of Anthrenus spp. became infestations. One group of dermestids, the Megatominae, occur most usually only in the wild where they are mostly associated with trees. Ctesias serra (F., 1792) is one such example whose larvae have conspicuous tufts of long spear-tipped setae on the posterior third of the abdomen so that in life they appear to be hauling small bundles; they live most usually under or in bark and like most dermestids prefer dry niches. A comprehensive highly commended guide to dermestids is that of Peacock (1993). On 19 October 2013 I found larvae of C. serra in the thick soft bark of a Wellingtonia Sequoiadendron giganteum (Lindley) Buchholz in my garden in Little Comberton, Worcestershire (SO93).. 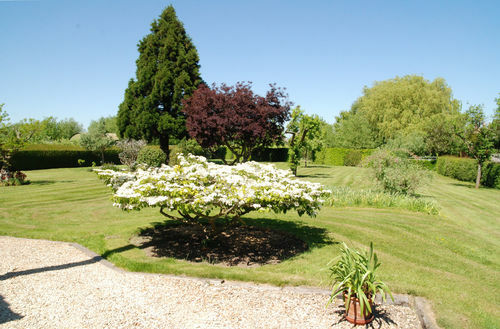 The tree was grown from a seed sown during 1975 and is now a significant landscape feature with a trunk circumference of 2.6m measured 1.8m from the ground. Ctesias serra rarely occurs on conifers but Peacock (1993) includes a citation for the related Redwood Sequoia sempervirens (D.Don) Endl. Other potential coniferous host trees are intimated by my records of adults on fir Abies sp. (also cited by Peacock, 1993) at Spetchley Park, Worcester (SO85) on 30 June 1985 and at resin on a recently felled Douglas Fir Pseudotsuga menziesii (Mirbel) Franco at Toddington, Gloucestershire (SP03) on 23 June 1987. I know of no other breeding records on Wellingtonia. 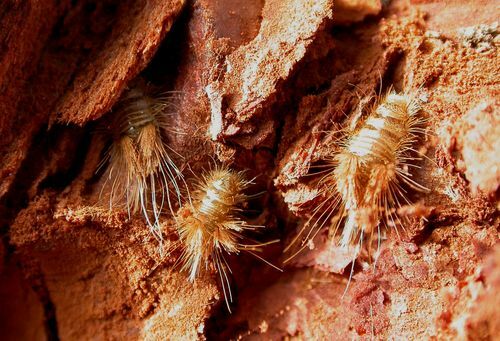 Larvae of C. serra are generally subcortical although on Wellingtonia and Sycamore they occur in dry fissured and exfoliated bark; wherever they occur they are usually scavengers on the remains of invertebrates in and around the webs of bark-dwelling spiders. Such fragments on the Little Comberton Wellingtonia included those of the conifer-associated weevil Pachyrhinus lethierryi (Desbrochers, 1875) bringing with it the implication that this relatively recent admission to the British fauna (Plant, Morris & Heal, 2006) is now associated with this Nearctic tree. In Britain I have records of larvae of C. serra throughout the year and adults throughout May, June and July with eclosed adults in situ during late April. C. serra evidently has no documented Quaternary history in Britain although prior to Alexander (2004) it was regarded as a weak indicator of historical continuity through ancient woodland. Although populations may burgeon on large veteran trees in ancient pasture woodlands due to the high surface area of the pabulum and the range of niches available on a single tree, C. serra is an example of the many woodland beetles that have become culture-favoured through their acceptance of cultivated trees in orchards, civic parks and arboreta. British host trees known to the writer include cultivated plum (rarely and then most usually on veteran trees), apple and pear, wild hedgerow pear, Pedunculate and Sessile Oak (on veteran trees especially), ash Fraxinus excelsior L. (especially), Sweet Chestnut, Horse Chestnut, Sycamore, Field Maple, White Willow, Crack Willow and cultivated hybrid Poplar although not all my data is mechanised. Interactive groups of >10 larvae have been observed on Field Maple and White Willow. Ctesias serra is dominantly a lowland species in England and Wales and rare in Scotland. It is remarkable that dermestids are up to now unrepresented amongst Irish saproxylic Coleoptera (Alexander & Anderson, 2012). My experience is that larvae descend almost to sea level; the highest breeding record in Worcestershire is at 170 m a.s.l but in the extreme south of France I have found larvae at 745 m a.s.l. although the species was not cited for its saproxylic interest there by Brustel (2004). Ctesias serra is widespread in Europe. Alexander, K. N. A., 2004. Revision of the Index of Ecological Continuity as used for saproxylic beetles. English Nature Research Report 574. English Nature Peterborough. Alexander, K. N. A. & Anderson, R., 2012. The beetles of decaying wood in Ireland: a provisional annotated checklist of saproxylic Coleoptera. Irish Wildlife Manual 65. National Parks and Wildlife Service, Department of the Arts, Heritage and the Gaeltacht, Dublin, Ireland. Brustel, H., 2004, Coléoptères saproxyliques et valeur biologique des fôrets françaises. Collection dossiers forestiers 13. Office National de Fôrets, Paris. 297pp. (Doctoral thesis, Institut National Polytechnique de Toulouse). Peacock, E.R., 1993. Adults and larvae of hide, larder and carpet beetles (Coleoptera:Dermestidae) and of derodontid beetles (Coleoptera:Derodontidae). Handbooks for the identification of British insects 5(3). Royal Entomological Society of London. Plant, C.W., Morris, M.G. & Heal, N.F. 2006. Pachyrhinus lethierryi (Desbrochers, 1875) (Curculionidae) new to Britain and evidently established in south-east England. The Coleopterist 15: 59-65. 01. Ctesias serra larvae on horse chestnut. G. H. Green. 02. Garden with Wellingtonia utilised by Ctesias serra. P. F. Whitehead.